While an estate plan may certainly include legal structures that advantageously transfer wealth to the next generation, there are many other parts that are important for peace of mind and to protect family from unnecessary burden. Estate planners must consider components such as planning for mental incapacity and guardians for minor children or even beloved pets in addition to a will. Often, those with sufficient assets may benefit from establishing financial and legal vehicles such as trusts. When put in place, these can facilitate the wishes and desires of an individual in transferring assets more easily, while often reducing the tax burden. Sharing from his experience in estate planning, Chad explains how important the family is in choosing the necessary legal documents. Once this phase is decided, he explains the most important next step is dividing assets into probate items and non-probate items. Establishing items as non-probate can facilitate a quick and easy transfer of assets in the event of passing. What Happens to Someone’s Assets When They Die? Transferring property to individual’s and/or organizations of choice upon death is one of the main reasons someone seeks the assistance of an attorney that assists with legal documents such as a will or trust. Chad explains that probate assets are items that don’t automatically transfer upon death. The probate process can be a lengthy court process. Ultimately, the state can decide the asset allocation in the absence of a will. Most people would choose to avoid this, as Chad explains how. Chad’s advice highlights the importance of working with a financial advisor that understands estate planning as part of their comprehensive financial plan. Krista explains how she uses a Transfer on Death Instrument (TODI) with her clients in order to help individuals select a beneficiary and avoid probate. How Do You Plan for Mental Incapacity? What happens when someone is no longer able to make their own decisions? Such incapacity could make it impossible for them to make decisions and take actions related to their finances and health. Often times, the state can make these decisions, without power of attorney documents in place. Chad offers his professional advice in planning ahead and choosing the best person to make these decisions. Although this topic is even a more difficult topic to discuss than the need for a will, it’s every bit as important to address in advance. In addition, since it covers health issues including life support decisions, it’s a matter a responsibility to take control of these decisions in advance. This can lessen heartache and stress of such choices for loved ones. It is highly recommended to seek a professional in establishing Power of Attorney documents that outline who and what choices are made. Who Do I Need on My Estate Planning Team? A comprehensive estate plan is best implemented with the assistance of many professionals that work together. 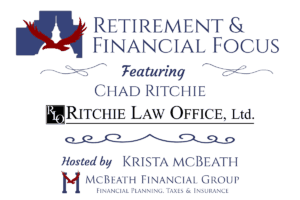 At the top of that list are Estate Planning attorneys such as Chad Ritchie and Wealth Managers such as Krista McBeath. In addition, when implementing the plan, it’s important to choose the correct team that will execute the plan at the designated time. In this segment, Chad advises viewers on the individual’s and the roles they play in these two stages of an estate plan. By planning ahead, designations can be made in legal documents to assign executors, trustees, power of attorney and even guardians as necessary. These documents can give an individual peace of mind in protecting their wishes. A document often associated with Estate Planning is a Trust. Although it is wise for everyone to establish a plan, many people simply need a will. Others may benefit from establishing a trust, usually when someone has considerable assets to transfer. In this segment, Chad discusses a Revocable Living Trust and his process for finding if someone can benefit from it. While Chad gives a brief overview, we recommend his recent blog article on Using Trusts to Protect Your Assets for more specific information. Within this article, 401K accounts and Life Insurance are mentioned as protected assets, and it’s another example of the importance of communication between an estate planning attorney and the financial advisor to have an optimal plan in place. Attorneys and financial advisors will both agree that an estate plan and the financial plan that goes along with it are living documents. Over time, such instruments may require adjustments as life changes occur, a financial position alters and even preferences alter. Similar to the need for evaluating financial strategies as we age, our estate plans often need reviewing. While procrastination is easy with a busy life, it only takes a minute to call and set an appointment for a financial review or an estate plan review. Ritchie Law Office can be reached at 309-662-7000 or via email at [email protected]. McBeath Financial Group can be reached at 309-808-2224 or via email at [email protected].